Boca Negra is one of the richest cakes we know (the name translates as “black mouth”). Its chocolate flavor is intense and deep. 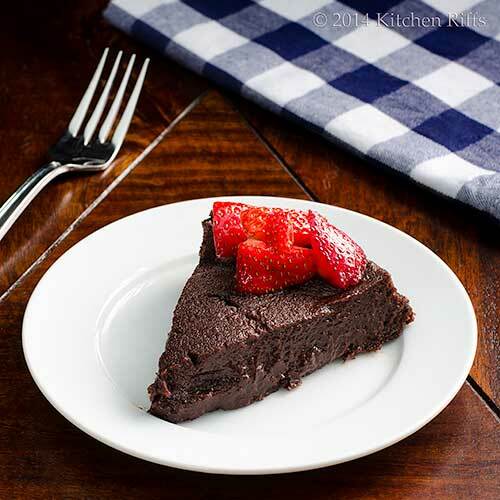 This dense, dark cake is perfect for special occasions. Like Valentine’s Day—a holiday that cries out for chocolate. And once you make Boca Negra Cake, you’ll be looking for new events to celebrate. So you can make it again. Our recipe is adapted from one in Baking with Julia. This cookbook, which was written by Dorie Greenspan, records all the recipes featured in the Julia Child PBS cooking show of the same name. Each episode would feature a different baker, and together they’d make one of that baker’s specialties. The baker who contributed this recipe was Lora Brody. Mrs. Kitchen Riffs is the baker in our household, and this is her adaptation. Prep time for the cake is about 20 minutes, with baking time of around 30 minutes. Then you’ll need to let the cake cool for at least an hour after it comes out of the oven (Boca Negra Cake is best served before it’s been refrigerated; see Notes.) So the total time until you’re ready to serve will be about 2 hours (much of it unattended). This cake serves ten to twelve (truly). Although it’s not large, it’s very rich. Leftovers keep for a few days if refrigerated in an airtight container. Position a rack in the lower third of the oven (remove the second oven rack or place it beneath the one you’ll be using to bake the cake; see Notes). Preheat the oven to 350 degrees F. Butter a 9-inch round cake pan and line it with waxed or parchment paper, then butter the paper. Place the cake pan in a larger, shallow pan (such as a large roasting pan with sides about 2 or 3 inches high), and set aside. Chop or break the chocolate into pieces of about 1-inch square (see Notes). Place the chocolate pieces in a medium- to large-sized mixing bowl. In a saucepan, mix 1 cup of the sugar with the rum. Heat on medium, stirring several times, until the mixture is boiling and the sugar has melted. Pour the sugar-and-rum mixture over the chocolate pieces and stir with a spatula or wooden spoon until the chocolate is melted. Cut the butter into 8 or 10 pieces, then place them in a microwave-safe container. Microwave the butter for about 15 seconds, or until it is soft but not melted. Stir the softened butter into the chocolate mixture a piece or two at a time, allowing each round of butter to melt before you add more. Break the eggs into the bowl of a stand mixer (or a medium-sized bowl, if using a hand mixer), and add the remaining 1/3 cup of sugar. Using the whisk attachment, beat the eggs and sugar for 2 to 3 minutes on medium (or until the eggs begin to thicken). Pour the egg mixture over the chocolate mixture and whisk together. Then whisk in the flour and mix until well combined. Pour the mixture into the prepared cake pan and smooth the top. Place the roasting pan (with the cake pan) in the oven. Pour boiling water into the roasting pan until it comes up about 1 inch around the outside of the cake pan (the cake pan may float in the water, especially if it’s a lightweight material such as silicone; this is OK). Bake the cake for 30 minutes—at which point it will have developed a thin crust on top. Remove the roasting pan from the oven and carefully take out the cake pan (be careful—it’s easy to burn your fingers). Place the cake pan on a wire rack to cool. Discard the water from the roasting pan. Place a serving plate over the cake pan and invert quickly. Remove the waxed or parchment paper from the cake. Allow the cake to cool for at least an hour (preferably until it reaches room temperature). Serve the cake by itself or garnish with ice cream, whipped cream, and/or fruit (such as fresh or macerated strawberries). For this recipe, we usually buy thin bars of Ghirardelli bittersweet chocolate and break them up by hand. But any good brand of chocolate will work. If the chocolate you buy is too dense to break by hand, just chop it with a knife. The original recipe for this cake calls for using bourbon. We think dark rum works better—especially since it combines so beautifully with chocolate. But use bourbon if that’s what you prefer. You could substitute light or amber rum in this recipe. But dark rum adds a particularly rich note. We generally use Myers’s Jamaican for baking, but any decent brand of dark rum should be fine. Eggs carry a slight (but real) risk of salmonella. So we suggest using pasteurized eggs when making any type of batter that you might taste raw. Although it’s unlikely the eggs you buy will be infected, why take the risk? Especially since most of us can’t make cake batter without tasting it. Make sure the water you add to the roasting pan is boiling hot. Otherwise, the cake will take much longer to bake because the water will have to heat in the oven before it starts cooking the cake. BTW, this cooking technique is called a “water bath” or bain-marie. Why use it? Because it allows the cake to bake in slow, gentle heat (the water never gets hotter than boiling temperature, or 212 degrees F). The cake cooks evenly in a nice humid environment, which helps prevent it from cracking and drying out. Why remove the second oven rack or place it beneath the one you’ll be using to bake the cake? To keep it out of your way when removing the cake from the oven. A bain-marie pan (which usually means a largish roasting pan) is unwieldy—and heavy when filled with water. So you don’t want a rack above it to get in your way when you’re trying to remove the bain-marie from the oven. Especially since those metal racks get very hot after a few minutes of baking. Mrs K R has burned her hands enough times to understand this all too well. Don’t over-bake this cake—it really should be done after 30 minutes. If you’re concerned, check its interior temperature with an instant-read thermometer. It should show a temperature of about 170 to 180 degrees F—which is perfect for this cake, IMO. The cake will be soft when you take it out of the oven, but it will set up as it cools. 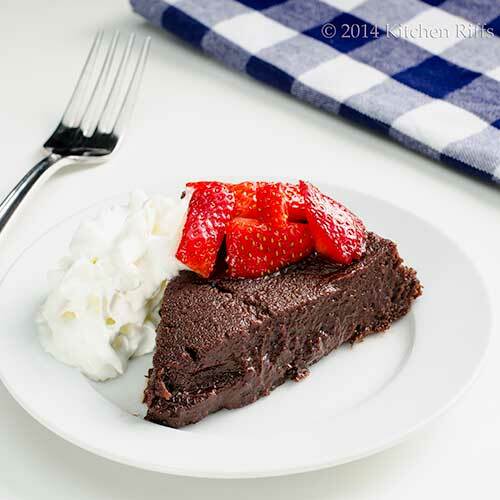 Boca Negra Cake is best when served at room temperature. But chilled works too. In fact, after the cake has been in the fridge for a few hours, it takes on the consistency of fudge. Hard to beat that! This cake is very rich by itself, so feel free to serve it “neat.” A garnish does add color and accent flavor, though. The original recipe calls for topping the cake with white-chocolate cream. That’s way too sweet for us. But we do sometimes serve it with whipped cream or vanilla ice cream if we’re feeling particularly festive. Knocking socks off indeed! I am saving this for V-day baking! Hi Debra, you'll love this! But better buy more socks. ;-) Thanks for the comment. Hi Greg, there are a lot of gems in that cookbook, but this is the best, IMO. Thanks for the comment. Hi Ansh, this one is totally worth making. You'll enjoy it. ;-) Thanks for the comment. Hi Anne, this cake is so you. You'll love it! Thanks for the comment. Hi Lizzy, indeed! ;-) Thanks for the comment. Pure decadence! Which, of course, is exactly what you want for a Valentine's Day dessert. Can't wait to try this one, looks amazing! OMG un cake extraordinario me encanta està de lujo,hugs,hugs. Hi Maureen, isn't this a great cake? One of the best I've ever had, if not the best. ;-) Thanks for the comment. Hi Kristy, this really is a decadent cake! Which is a good thing. ;-) Thanks for the comment. Hi Rosita, isn't this wonderful looking? OMG indeed! Thanks for the comment. Richness--just my kind of dessert! Sadly, my family isn't a big fan of over-rich chocolate/cake, but I'm sure I can find a chance to make this at some point. I keep Kahlua but not dark rum stocked in my pantry--what do you think about this sub? Glad you're back to the oven, John! Hi Nee, 11-1/2? This cake is for you! Truly delish. Thanks for the comment. Hi Ala, I'm sure you'll figure out a good time to bake this.Kahlua might be an interesting substitute -- it certainly wouldn't hurt! Thanks for the comment. Hi Raymund, this really is a dynamite cake! Truly worth having. ;-) Thanks for the comment. Can you pass me a plate of that dessert please? Wow - great dessert and I always love strawberries with chocolate. Thanks for posting this one John. Hi Lea Ann, isn't this a great cake? Pretty addictive, too. :-) Thanks for the comment. This cake is so perfect for the upcoming Valentine's Day! Love the strawberry and whipped cream on the side. This looks gorgeous - and I'm not even particularly a fan of chocolate! Great choice for Valentine's Day. Hi Peachy, isn't this such a great dessert for Valentine's Day? Really a lovely recipe. Thanks for the comment. Hi Beth, this really is a great recipe, and could make someone who isn't a chocolate fan, a fan of this dessert, at least. Thanks for the comment. I can vouch for this recipe! It is amazing...and perfect for Valentine's Day!! A beautiful and festive cake! 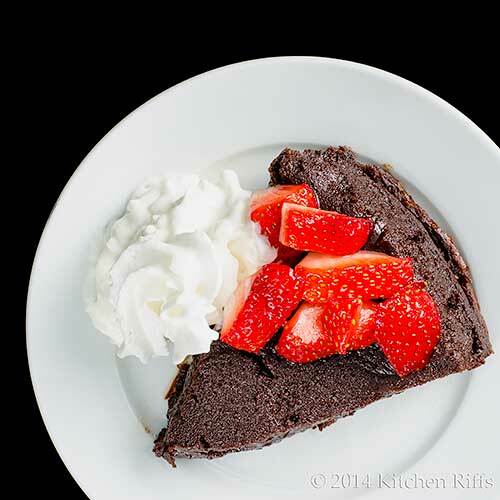 The best chocolate cakes are dense and need only a side of whipped cream. Kristi, this is definitely something you should try! Super good stuff. Thanks for the comment. Hi Liz, I was actually wondering whether you'd know this recipe! You're such a great baker and do so much of it. Isn't this wonderful? Thanks for the comment. Hi Nazneen, the whipped cream may actually be overkill in this case! Makes for a pretty picture, though. ;-) Thanks for the comment. I agree this recipe looks and sounds like it would be perfect for Valentine's Day. I am a all for chocolate, so I think this one is calling my name. John, your photos depict the lush quality of this beautiful cake. Moreover, the disserte of tips and suggestions regarding the recipe makes for an excellent read. Nice work! Definitely would be serving this neat. It doesn't need anything else! It looks so rich and creamy and yes, perfect for Valentines! Hi Dawn, I find it impossible to resist chocolate too! Thanks for the comment. Hi Brooks, this really is a lush cake -- and totally delish. ;-) Thanks for the kind words, and for taking time to comment. Hi MJ, in truth, we always serve this neat too, or maybe with just a few berries. It's always fun to add ice cream or whipped cream, but it makes it awfully hard to finish the dessert -- just too much. Thanks for the comment. This is seriously one good looking cake and so rich and tempting. I am bookmarking this to make it for my daughter. Being chocoholics, Boca Negra cake is exactly the chocolate kind of cake that we are after. It will extremely torturing for us just to eat this cake during Valentine's Day... LOL! Oh, what a devilish cake! Really decadent and irresistible. I can't believe how good it looks! 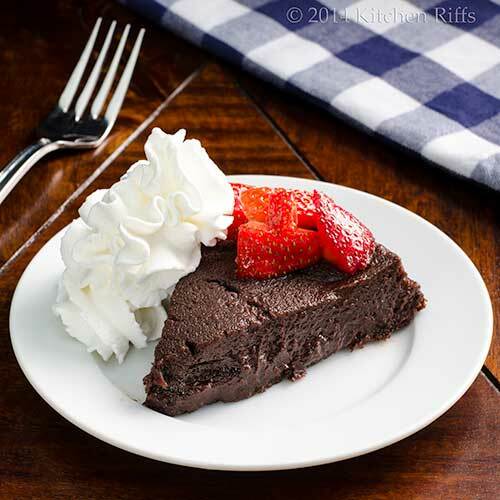 The rich chocolate is so inviting, and the perfect tribute to the Valentines in our lives. Bookmarked. Hi easyfoodsmith, this is totally worth making. Your daughter will love it! Thanks for the comment. Hi Zoe, this is one of those cakes that you'll end up making again and again! Although it's really rich, so it won't become an everyday cake. Thanks for the comment. Hi Rosa, this is really super. Great for weekend fare! Thanks for the comment. Hi Charlie, I think you'd like this -- it's so worth making! Really deep flavor. Thanks for the comment. Hi Minnie, this is a wonderful cake! And as you say, so nice for the Valentines in our lives! Thanks for the comment. Hi Asmita, who knew sin could be so good?! It really is a delish cake. Thanks for the comment. My husband's birthday is the day before Valentine's Day so you can probably guess that I am always looking for a new recipe to celebrate both days properly. This is a great candidate. Love the rich, decadent look of this one. The bain marie is such a great idea. I can't wait to add this to my chocolate cake repertoire! I need something luscious in my life right now. And i can always use a new pair of socks! Hi Karen, this would be a terrific birthday cake! Really a nice dessert. ;-) Thanks for the comment. Hi Abbe, the bain-marie really does work well. And who couldn't use a new pair of socks? ;-) Thanks for the comment. I want a big piece of this cake on Valentine's Day and every other day! This cake looks positively sinful. I want to stick a fork right through my screen for a big bite! I'm hypnotized by its texture. A pink lady and a slice of this = perfect Valentine's. Hi Pamela, I think this would make a good daily cake! ;-) Thanks for the comment. Hi Laura, it is sinful, it is! Awfully good. ;-) Thanks for the comment. Hi Ashley, isn't this just the thing for Valentine's Day? A wonderful dessert! Thanks for the comment. Hi Alex, the texture of this is amazing -- truly delish. Thanks for the comment. Hi Michael, this really is sinful! In a good sort of way, of course. ;-) Thanks for the comment. I'm having a problem already with letting the cake cool. I'm not sure I would be able to wait that long, seriously:) I was contemplating a Blackout Cake for Valentine's Day but since Mrs. K.R. is tempting us with this indescribably delicious looking cake of decadence, I've just done a 360 and lost both socks! OMGoodness!!! Love the addition of Rum and you know me, I'm a usually a Kahlúa gal. Hi Louise, sorry about the socks. ;-) This cake is so worth making -- you'll love it. Thanks for the comment. Wow, this looks amazing! It looks so decadent and rich (boozy too! ), just the way I like my chocolate cakes. :) Great recipe. A handful of ingredients is all it took to make that amazing cake? Incredible! Hi Gomo, this really is such a wonderful cake! Really, really rich -- just what I like. ;-) Thanks for the comment. Hi Kristi, this is a fairly short ingredient list, isn't it? But the flavor is big! Thanks for the comment. That's quite a bit of rum.. chocolate and rum? You know I'd ask for seconds and start sneaking bites in the middle of the night!! Love that it's called "chocolate mouth"!! Hi Dahn, bourbon is good, but we much prefer rum. And although it adds a bit of flavor, I can see how this would be excellent when made alcohol free. Great cake, isn't it? One of our favorites! Thanks for the comment. Hi Barbara, that is a lot of rum! Fortunately most of the alcohol evaporated during cooking (although some always remains), leaving its great flavor! I can manage seconds of this if I've had a light dinner, otherwise this is just too rich! Thanks for the comment. Wow, that cake looks sinful! I am sure the addition of rum intensify the flavor of chocolate. I would definitely take bites if someone is serving it for me for Valentine's day. Hi Holly, it is sinful! Who knew sin could be so sweet? ;-) Thanks for the comment. What a beautiful dessert John, the intense color is so pretty...I wish I could have a spoonful of this right now...yum! I am so making this as soon as my chocolate supplies are refilled. It looks like chocolate heaven! No such thing as too much chocolate when it comes to V-day. Any cake that is a sock-knocker is a must make. I'm miss those shows, always something inspiring. Happy Valentine's Day to you two!! What an amazing looking cake. It looks so rich and custardy, great tips about removing the oven racks too. If it's a Dorie Greenspan recipe, it must be awesome. Love her stuff! Hi Juliana, isn't this nice? And intense is definitely the word for it! Thanks for the comment. Hi Gintare, this is definitely worth making. You'll totally enjoy it. Thanks for the comment. Hi Gina, that was a great program, wasn't it? And this cake was the best recipe of the series, IMO. Thanks for the comment. Hi Julie, that oven rack tip really is worth following. Particularly since once you make this cake, you'll want to make it again -- and you don't want to risk burning yourself! Thanks for the comment. Hi Carolyn, isn't she a terrific recipe writer? One of the best in the biz -- and her recipes always work. Thanks for the comment. mhm bittersweet chocolate... I wouldn't be able to stop myself eating all the slices, even if it's a rich cake. Somehow I have seen this cake somewhere before. Not sure if it was online or offline. John thank you for reminding me, I can't wait to dig in! Oh wow - I think you managed to combine all of my favourite desserts. Hi Helene, I'd assume other people have blogged about this cake -- it's sensational! Really worth trying. Thanks for the comment. Hi Candy, always happy to oblige! ;-) Thanks for the comment. I saw this on the fly the other day and thought it looked so decadent and lovely. I just saw it on Photograzing and had to come back for another look. Gorgeous in every way! Hi Sage Trifle, isn't this nice? The flavor is so wonderful. Thanks for the comment. Ai, ai, ai...I could not be around such a luscious, decadent cake otherwise the whole thing would disappear in a blink of an eye. Wishing you a very happy V-day! Hi Denise, isn't this wonderful? Although it really is hard to eat more than a couple of pieces of this -- so rich! Thanks for the comment. Hi Laura, you'll be really happy with this dessert -- it looks pretty good, tastes much better! Terrific combo, no? ;-) Thanks for the comment. Hi Kiran, rum + chocolate = heaven! Such a great combo. Thanks for the comment. Just in time for the V-Day celebration! I was originally thinking of making molten chocolate cake for the dessert but I might have to change my mind. I can't wait to serve this with a scope of my favorite ice cream! Thanks for sharing! Hi Yi, this is such a wonderful cake! Although I have to say molten chocolate cake is pretty wonderful too! Thanks for the comment. Hi Aurica, this certainly is an excellent end to any meal! Thanks for the comment. Hi Karen, who can resist dark rum and chocolate? Not me! Thanks for the comment. Incredibly rich...and beautiful. I like. Hi Kitchen Butterfly, this really is over-the-top rich. But awfully good. ;-) Thanks for the comment. Hi Carol, Mrs K R will be pleased to learn she has yet to reach middle age! ;-) Licking your screen is appropriate, I think. More appropriate is making this, and licking your plate! Much more satisfying, too. Thanks for the comment. Hi John, this look like to die for kind of dessert. Very chocolatey and so moist. Good recipe, thanks for sharing with us. Hi Amelia, isn't this wonderful? Definitely worth trying. Thanks for the comment.